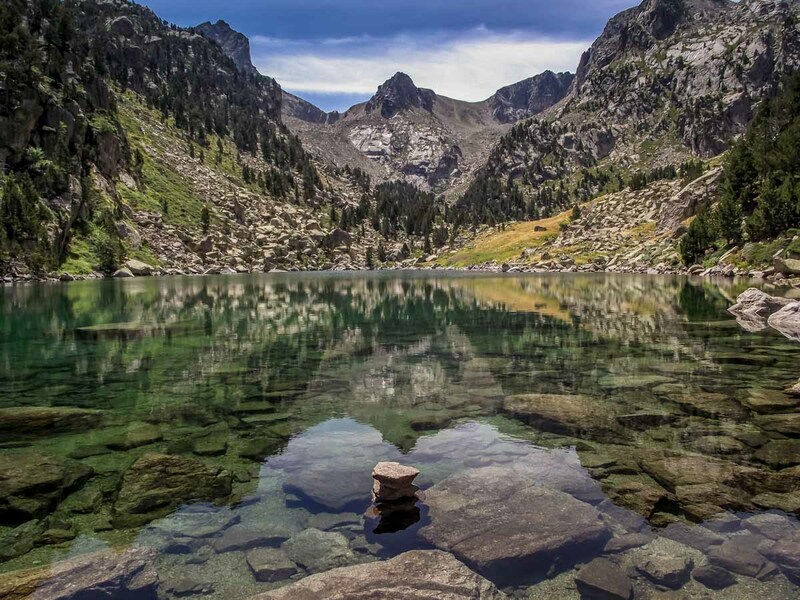 In the far north western corner of Catalunya lies its best kept secret; Aigüestortes i Estany de Sant Maurici National Park. 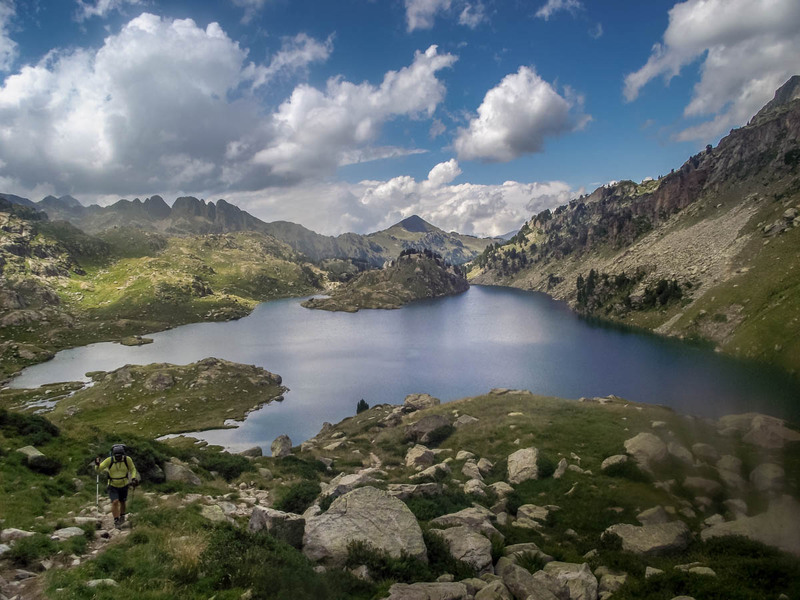 It is a land of enchanted mountains, sparkling glacial lakes, and some of the best walking routes in Spain. 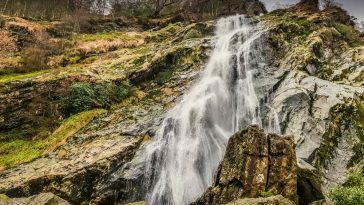 The park takes its name from the network of nearly 200 mountain lakes and waterfalls scattered throughout, and it is these water features which help make the park so beautiful. 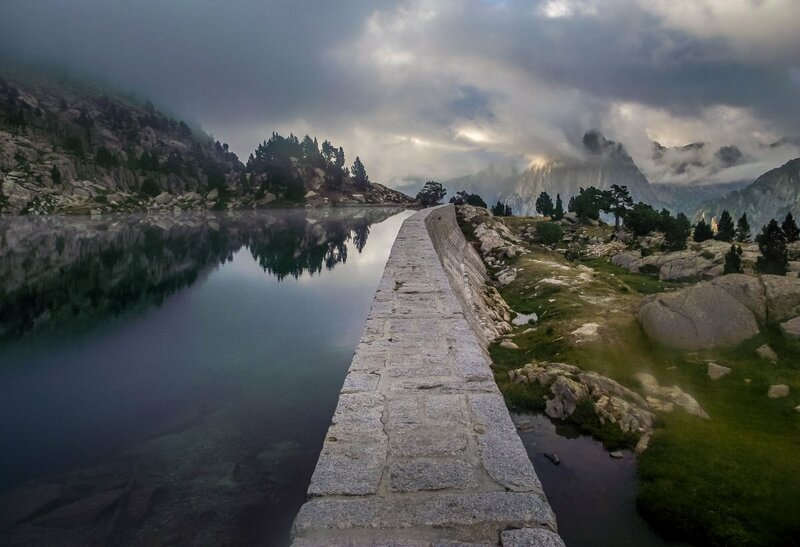 Aigüestortes translates from Catalan as twisted waters and Lake Sant Maurici dominates the eastern end of the park and is enjoyed by most day trippers. 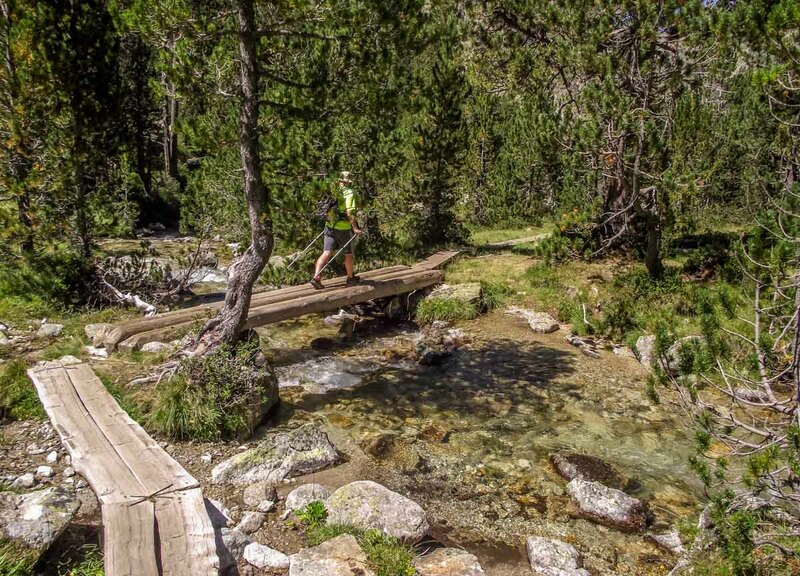 However, those willing to explore the trails beyond Sant Maurici are rewarded with isolated valleys, dramatic mountain cols, and crystal clear lakes that reflect and invert the mystical mountains around them. 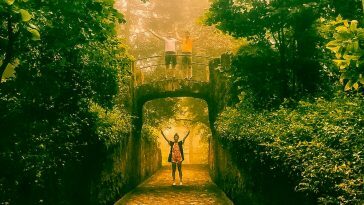 There are two main gateways into the park that also serve as potential bases; Vall de Boí in the south and Espot to the east of the park. Vall de Boí is famed for its proliferation of 11th and 12th century Romanesque churches which have led to it being designated a UNESCO World Heritage Site. 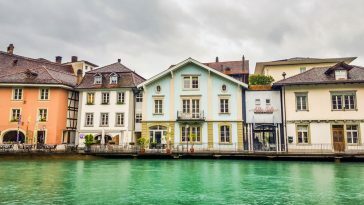 The pretty village of Espot is home to skiers in the winter months but also makes a useful base for summer walking with enough accommodation, bars, and restaurants to keep you refuelled for a week in the mountains. We stayed in a hotel here for our week of exploration after travelling by hire car from Barcelona, which is around 3 1/2 hours drive through the Catalan countryside. Cars are not allowed into the national park. 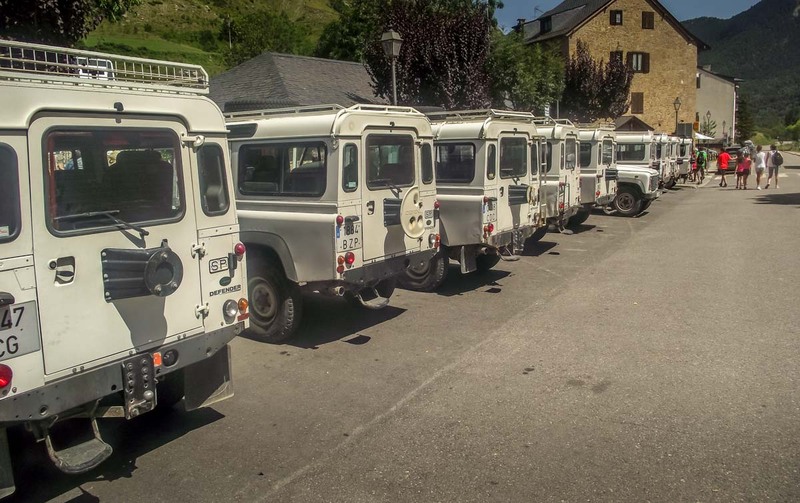 Instead visitors are whisked up into Aigüestortes by 4×4 taxis. In Espot tickets are purchased from the ticket office before you are crammed into one of the 4×4 vehicles and taken up 6km of dirt track to the main drop off point at Lake Sant Maurici. It’s not the most comfortable ride that you’ll ever make but the 10 euro return ticket is money well spent, as apart from cutting out additional trekking, the drop off point is also 600 metres higher than the paths that start from Espot. The Espot cabs also run shuttles to other distant drop off points which cost more, although you may need to wait for a cab to be filled up before it leaves. 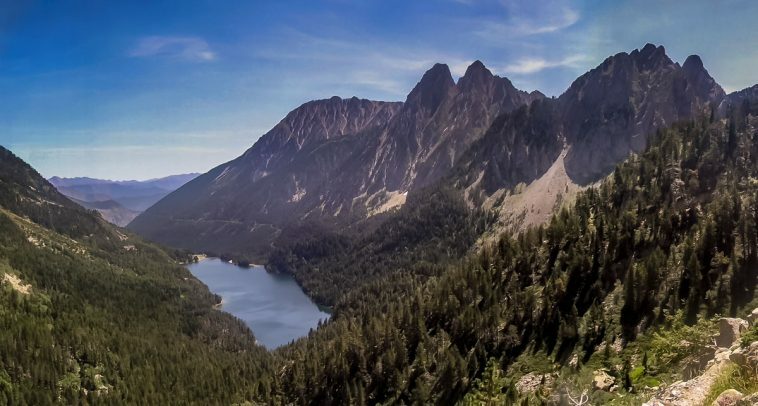 Many years ago, I remember seeing a photo on the front of a guide book of a twin peaked mountain next to a twinkling lake and thinking that I need to go there. 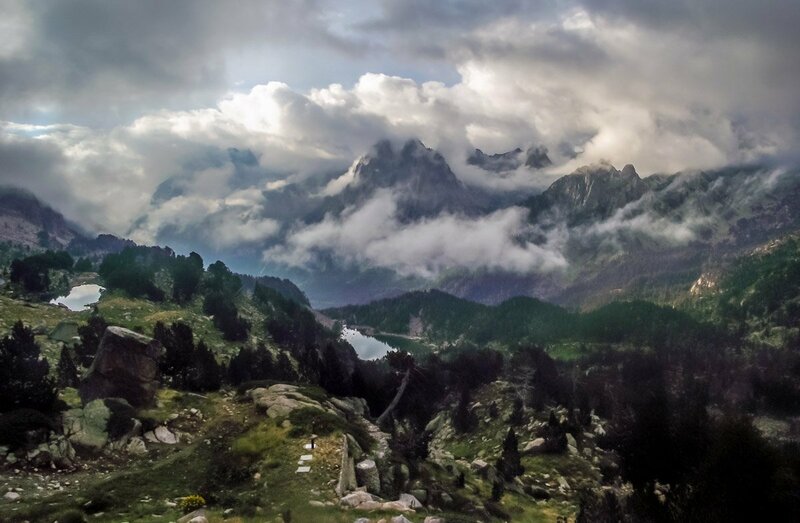 That mountain was Els Encantats – the enchanted ones – and the lake was Sant Maurici, and these dramatic views that greet you at the taxi drop off point mean that you’re reaching for your camera before you have even left the taxi. 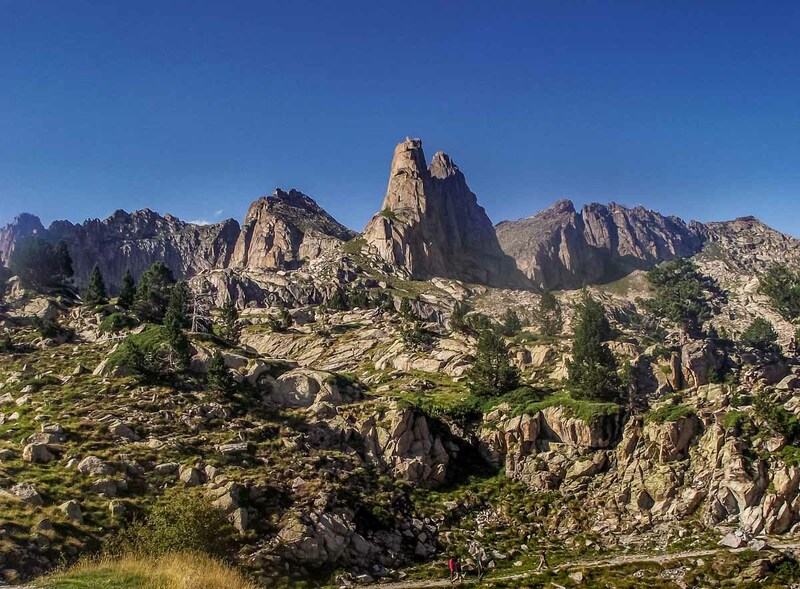 Legend has it that the peaks of Els Encantats were created when two hunters were turned into stone and the are the most striking feature of skyline above Sant Maurici. This area of the park is busy and justifiably so. We spent our first day doing a circuit of the lake, passing the Ratera waterfall and lake, stopping for photos at the mirador overlooking the western end above Sant Maurici before heading back to the taxi drop off to get our ride back home. We did some other gentle recovery day walks from Sant Maurici lake into the Monestero and Subenuix valleys. 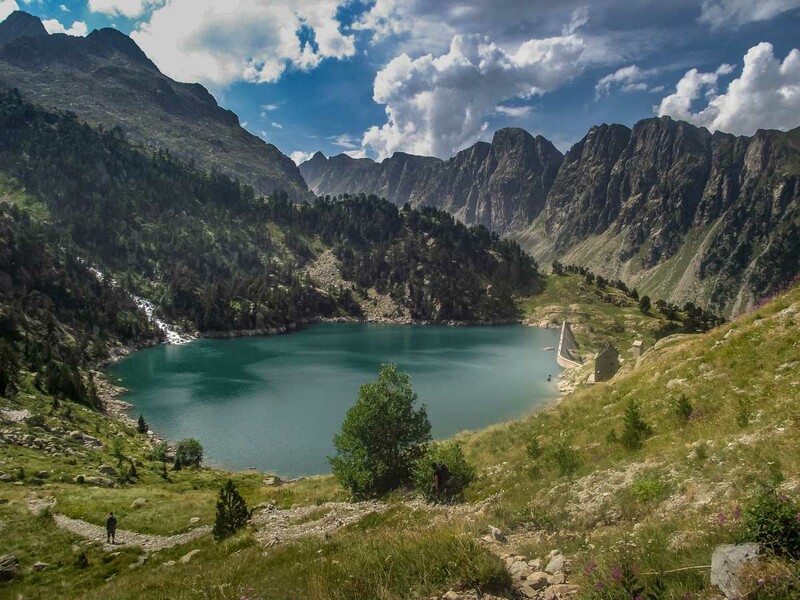 This Catalan end of the Pyrenees typically has more sunny and dry days than the Western Pyrenees and we certainly enjoyed the warm weather, ambling through these pretty green valleys with deep blue skies above reflecting in the valley lakes. The water here is so clear and pure that there were times when you had to bend down to touch the shallow valley streams to test that there was actually water there so clear that it was. Above us vultures soared, circling in the warm summer thermals, and like us searching for a spot to enjoy some lunch. 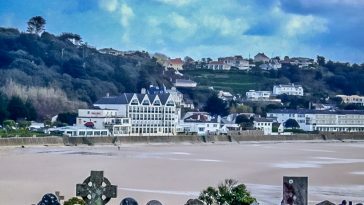 The most famous route through the park is the Carros de Foc – the chariots of fire – which links together the nine mountain refuges located within the park on a 55km circular route. Typically, people will do the route over 5 to 7 days visiting each of the refuges in turn to get their route cards stamped and staying overnight in some. Sleeping is usually in mixed dorms which is not for everyone, but the refuges are reasonably well equipped, have hot showers, food and drink, and more than anything they are usually full of welcoming people. We did a three-day trek on part of the route staying overnight at the refuges of Restanca and Amitges. 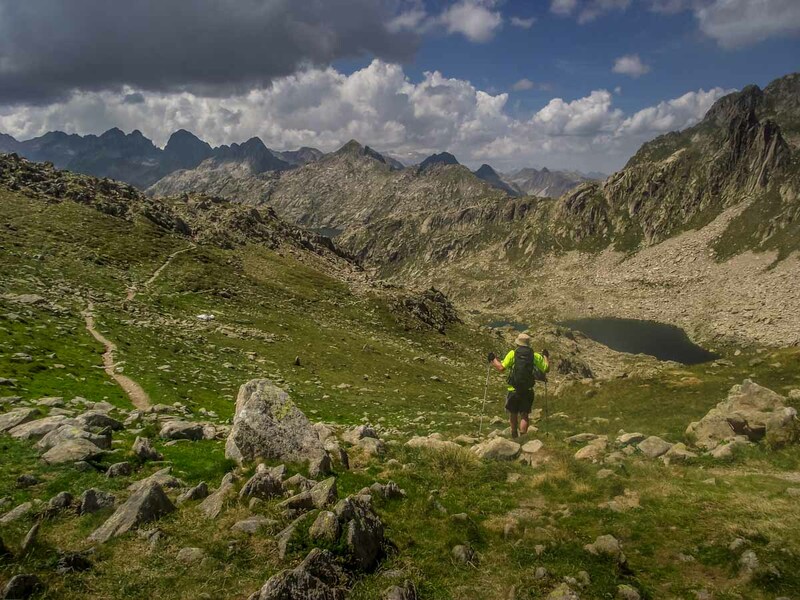 Our journey started in the Val d’Aran to the north of Aigüestortes. It’s an area which although technically in Catalunya, is really an area in its own right with its own customs, cuisine, and language, Aranese, which could be described as a mixture of Catalan and Gascon French. The valley is geographically cut off from the rest of Spain and historically only high mountain roads were passable in the short summer months until the Vielha tunnel was built in the last middle of the last century. It does look and feel different from the other areas of this corner of Catalunya, and the lush valley contains some lovely little villages as well as the main town of Vielha which are worth investigating. There are also a small population of bears in the Val d’Aran although sightings of these by walkers are very rare. Our trek started after leaving the main road and the grey tiled houses of the village of Salardu from where we followed a very narrow road to the car park at Banhs de Tredos. From here we took another mountain taxi to the drop off point just a short walk from the Colomèrs refuge and lake. On reaching the lake the Cirque de Colomèrs came into view to the south of us; a seemingly impenetrable 6km semi-circle of peaks, and there is a great circular walk which takes in the many lakes which nestle in between the smaller undulations below main ridge. Our path headed west up and over a few mountains cols in the direction of the Restanca refuge. The paths here are good and clear, and even when the cloud came down for short while route finding was relatively easy. As we made our way through the mist we encountered some herds of cattle, marmots, the odd mountain goat, and when the clouds cleared a few more vultures. Even in the peak months of July and August we only passed a few groups of people each day, and as is always the case with walkers we stopped to exchange pleasantries regardless of language barriers. Our final path was a steep descent to the Restanca lake and refuge on what was now a sunny evening. We had booked in advance – as it is important to do in peak months – and our smaller room was made up of a few bunkbeds that we shared with some Norwegian walkers. Dinner in these refuges is a communal affair and usually involves large portions of hearty food which is well received after a long day’s walk. As we were new to the experience we were a little unsure of the etiquette, but a simple rule seemed to not be shy and get stuck in. Large pans of soup were soon followed by salvers of piled chicken portions and pasta and everyone mucked in to dish the food out, and then to collect used plates and cutlery afterwards. Beers and wine could be purchased, and we enjoyed a few glasses as we exchanged stories about our journeys so far and plans for the next day. Most of the other guests were Spanish so two English lads were a bit of a curiosity to them, but I invariably find mountain people to be the friendliest, and they made every effort to make us feel welcome. The following morning, we woke to the sound of thunder and lightening as a mountain storm brought hailstone and low cloud. This is the mountains after all and storms can be frequent, especially in August although if they do come then they are more likely arrive in the late afternoon. Breakfast was provided by the refuge and we also purchased a pack lunch to take on our way. After waiting an hour for the storm to pass we retraced some of our steps from the previous day on our way to the Amitges refuge. This was going to be a tough day with 17km of distance plus over 1300 metres of ascents as we travelled up and down 3 separate mountain passes. However, walking at a steady pace with beautiful views all around meant that the hours passed by a pleasurable pace. We stopped for lunch at Refugi de Colomèrs before following the GR11 path through a beautiful valley dotted with firs and pine trees and more lakes on our way up and over the Port de Ratera col before heading down to Amitges. The views at Amitges were particularly good, as was the great food and hospitality that we shared that evening. The downside to sleeping in shared dorms is that there is usually at least one snorer that might keep others up. Unfortunately for the others in our room that night the snorer was the other member of my party. Fortunately for us we had the presence of mind to have packed earbuds that meant we slept through the apparent cacophony of snoring that night. We noticed a frostier reception than we had previously been used to when we appeared for breakfast the next morning, but it only proved the importance of packing all that you need, including earbuds, when heading for the mountains. We headed back towards the taxi pick up point, but not before passing through more picturesque valleys dotted with an assortment of lakes. I’ve done a lot of walking in northern Spain and there are some beautiful places to explore. The clue was always in the title but the thing that makes Aigüestortes stand out from the rest is the water; the glacial lakes of all different shapes and sizes that reflect the mountains that climb above them, the waterfalls, the small crystal-clear streams that bring life to the meadows and valleys of the national park. 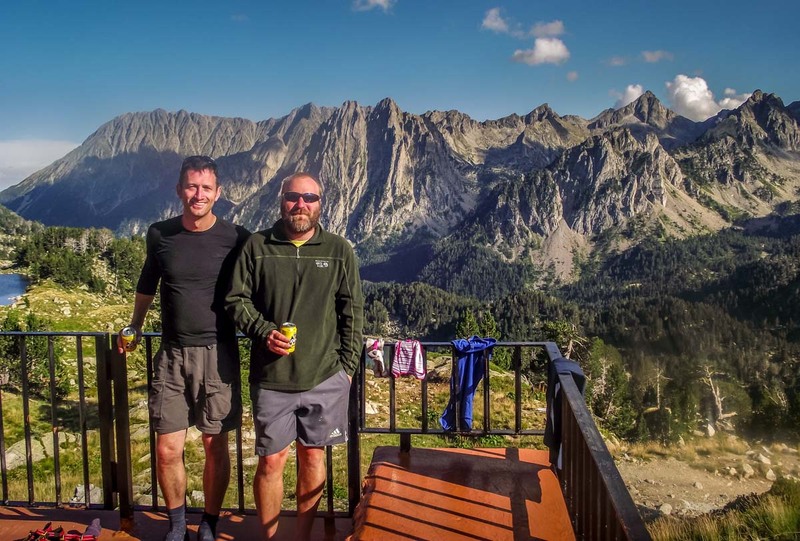 Add to this some Catalan sunshine, the fabulously located mountain refuges, and some friendly hospitality then you have all the ingredients for a great walking holiday. You should go.